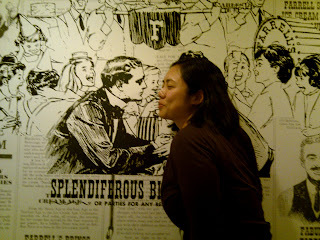 Yesterday was a very serendipitous and happy day! I lost a pair of my favorite earrings earlier this week and yesterday, someone in my apartment building left one earring taped to the mailboxes with a note looking for its owner. Me! And minutes later when I pulled my keys to open the door to my apartment, I found the other earring hanging from my keyring. Now, how lucky is that? The earrings are cheap but they're of great sentimental value as I bought them on my Hawaii trip earlier this year. This is not related to food or drink but this is how my lucky day began. 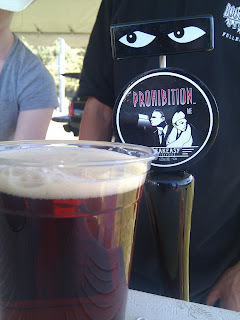 In the afternoon, Julie and her boyfriend, Dave, and I went to Tributefest in Santa Clarita and we were lucky again when another friend hooked us up with free wristbands that got us unlimited pours to the 30 beers that were on tap and that saved us $40 each. There were also over a dozen food trucks and we padded our stomachs with deliciously greasy Philly Cheesesteaks ("wit" and cheese wiz of course) from the South Philly Experience truck and shrimp dumpling and sticky rice from the Dim Sum Truck. Aeromyth (tribute to Aerosmith) was the best band of the day and after I don't know how many beers, the lead singer really did start to look a lot like Steven Tyler. I think he was actually skinnier than the real Tyler! My favorite beer yesterday - Speakeasy's Prohibtion Ale with a nice hoppy aroma. Too bad they weren't pouring the Big Daddy IPA though. I think Julie and I drank from like 3pm to a little after 8pm but we weren't badly drunk. Slow and steady takes the cake...plus, dancing and water helps a lot. On the way home, our designated driver, Dave the Enabler, took a shortcut and in my tipsy state I made a serendipitous discovery. 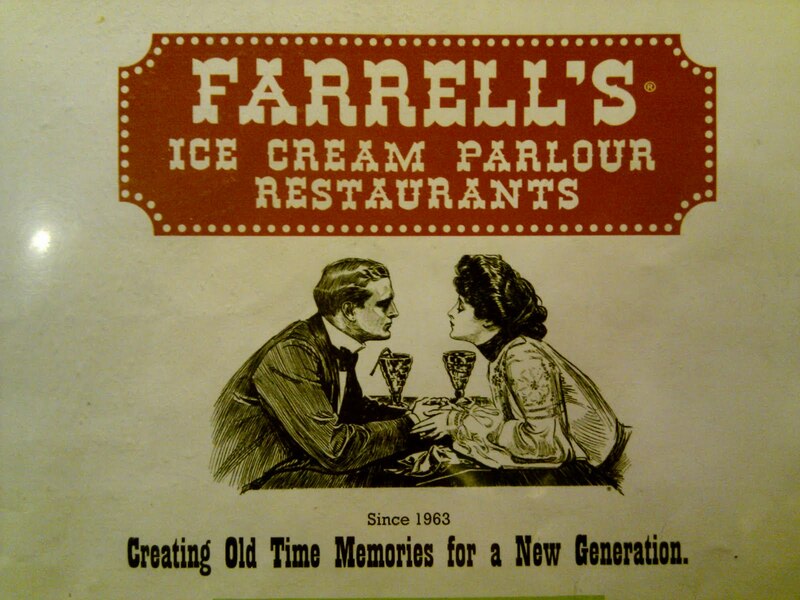 I spotted a sign for Farrell's Ice Cream Parlour! If you read my last post about the joy and nostalgia a banana split brings me, then you'll understand when I tell you that I yelped (aka screamed with joy) when I saw the Farrell's sign. Dave immediately did a u-ey and we ended up at one of the happiest places of my childhood. I think I was in my super enthused HungryKat mode due to the beers and the excitement of seeing Farrell's. This gift and candy display was behind the register and not exactly open to foot traffic but I asked to go in and see the giant lollipops and goodies and I was in before the staff (nice people) could say no. 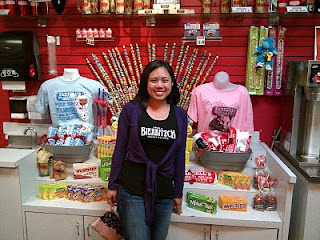 And yes, for Tributefest, I was rockin' the Bierbitzch tank I got from LA Beerfest a few weeks ago. "Creating Old Time Memories for a New Generation." 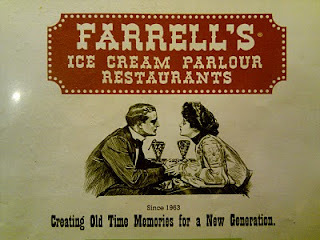 I think Farrell's has been using this image since its beginning in the 1960s. I really love it. Notice how they're holding each others hands with a milkshake in between them; even as a little girl, I found this image very romantic and now I especially love the 1920s era it evokes. For some reason, now it also makes me think of Chicago or New York in the 1920s. It must be the influence from reading The Devil in the White City. There were only three of us so we didn't order any of these giant ice creams. 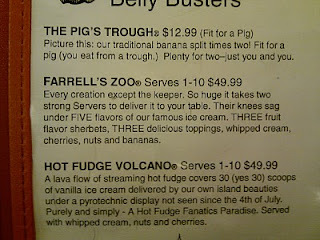 When you order any of the three, the staff bangs a drum and sings a song or does a shout out to let everyone in the restaurant know you're a little piggie. Amazing! 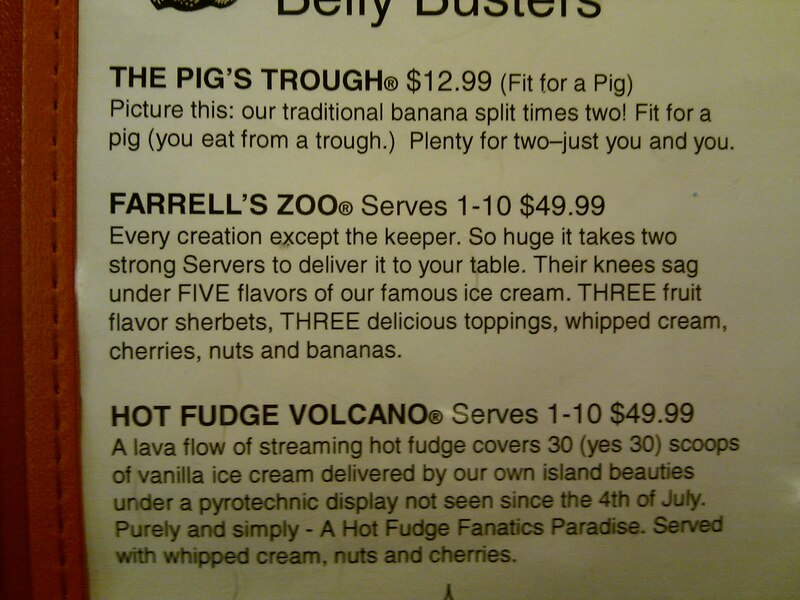 Because we stopped at Farrell's, Dave revealed that he used to work at a Farrell's in Staten Island when he was 15! He talked the manager into giving me one of their signature styrofoam hats (they've been using them forever) and he got me a lovely souvenir shirt for my fake birthday. Yes, I shamelessly pretended it was my birthday yesterday so they would bring the drums and sing a song for me and give me a free birthday sundae. Well, it's almost my birthday anyway and hey, it wasn't all free. Dave told them they had to embarrass me more than usual. I had to get up and wear this silly straw hat. 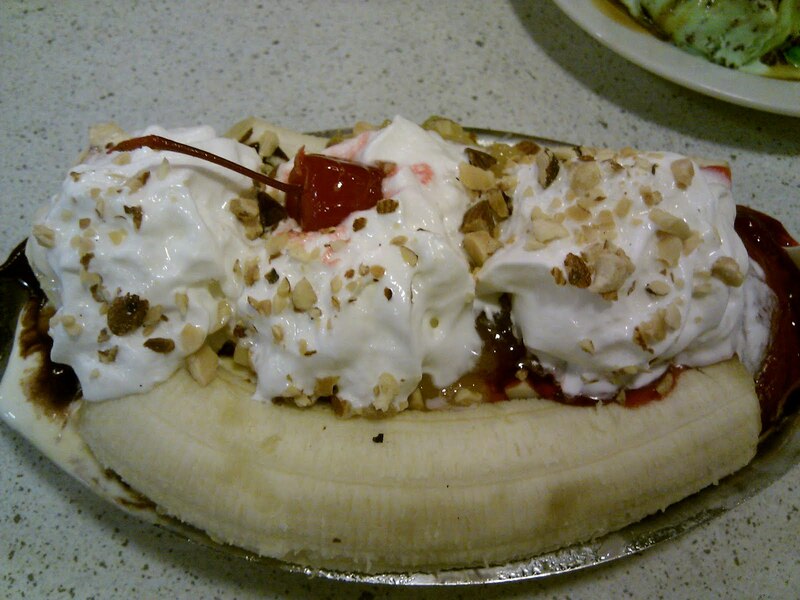 Julie ordered the Banana Split. Still delicious but they still only put one cherry on the top. The Fake Chicken Dinner. 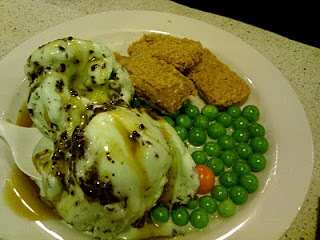 The chicken nuggets are butterfingers, the peas are mint candy and the ice cream is supposed to be vanilla with caramel sauce to make it look like mashed potatoes but Dave chose mint ice cream. The drum. I think they brought out the drum like five times last night for birthdays including my fake birthday. All of them were kids except me. Well, I'm a kid at heart. It was so cute to see all the kids' excited and happy faces when the staff banged the drum and had the kid stand up before they sang a special song for them. The song wasn't your standard "Happy Birthday" song; Farrell's has a few birthday songs on rotation that are fun and playful. 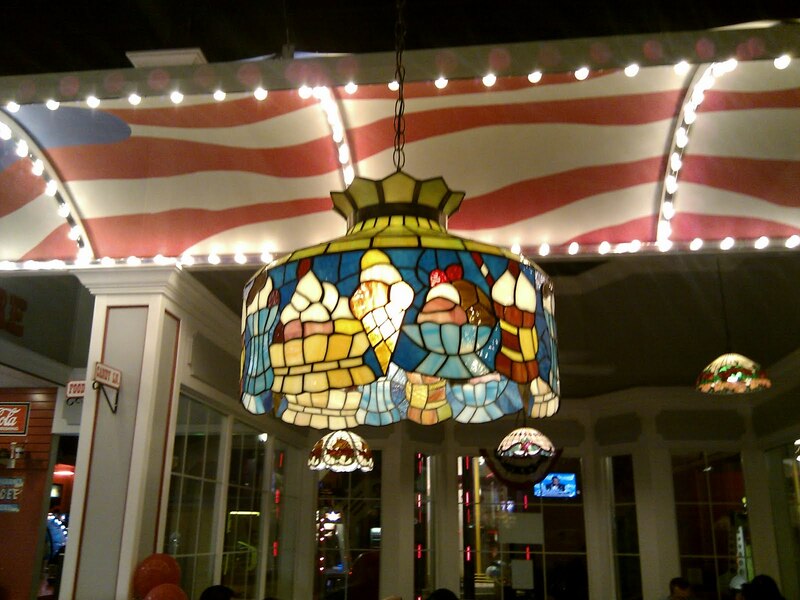 I love this glass ice cream lampshade. 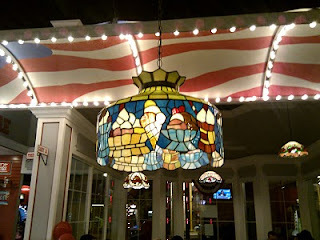 They had many glass lampshades in the restaurant but only this one had an ice cream motif. I started my day with beer and ended it with ice cream. How perfect and how lucky am I? I want to give a shout out to our server whose name is also Katt (two ts); she was so friendly and enthusiastic and totally humored and indulged all my tipsy and nostalgic antics and let me walk all around the restaurant like a kid at Disneyland. I was especially happy to be able to share all of it with my friends. The last six months has been full of ups and downs and yesterday was one of the happiest days I've had in a long time. May Day. Rebirth. *There used to be 130+ locations in the U.S. but when I was a kid, they started shuttering them and now there is only one other location in California located in Mission Viejo. Angelenos, don't be afraid to drive out of the LA vicinity. It was just a perfect day in every way! Great write up. 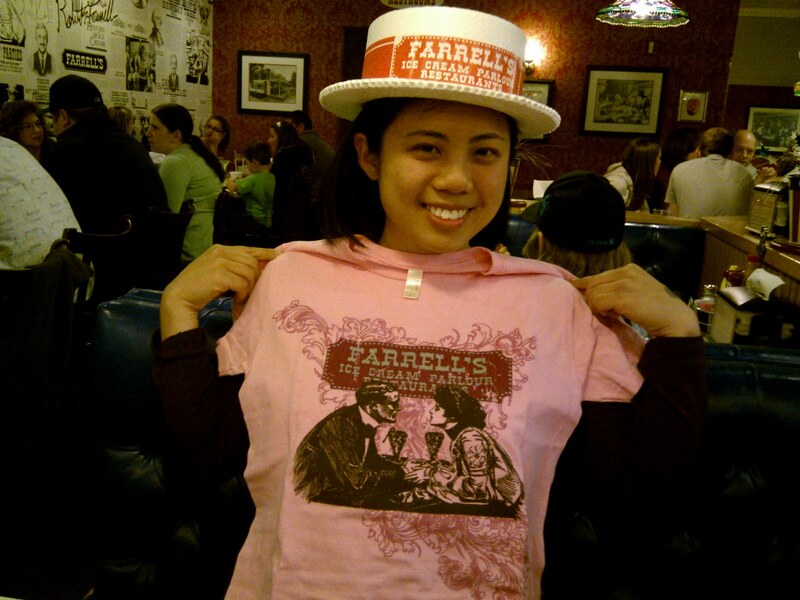 I can't wait to visit Farrell's again and am rockin' my pink Farrell's tshirt today. 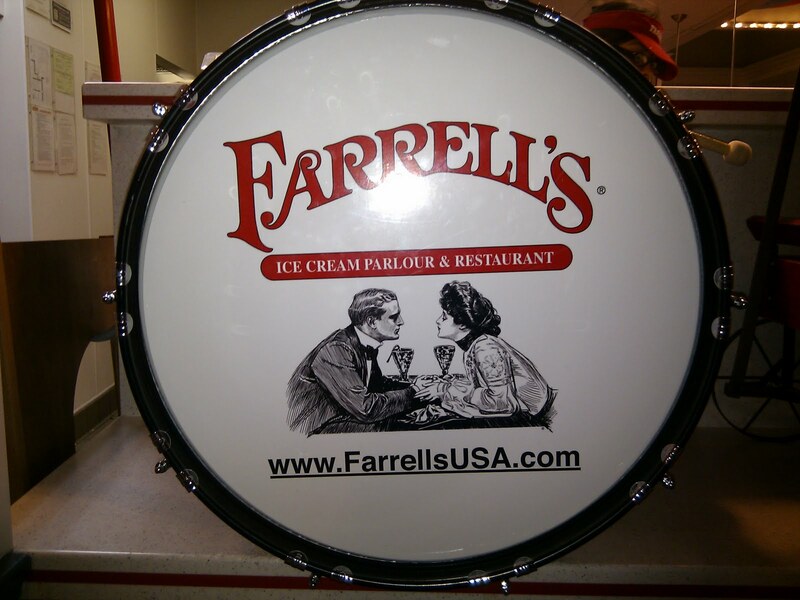 Farrell's ROCKS! What a great experience you had! PIG TROUGHS FOR EVERYBODY!!! I know you have a video Kat, let's see it!! !